For Brianna Ahearn, 35, a copy writer who works at home in Cincinnati, time means money. “It’s a self-employed household, so having something ready to eat is valuable because my time is valuable,” said Ahearn. A loyal customer of the meal-kit delivery service Blue Apron, she says she likes the company for its internationally inspired recipes and recently expanded meal options. Lately, however, her deliveries have been late. Ahearn has received her meal kits late five times since she signed up in April, four of them between Sept. 2 and Nov. 11. 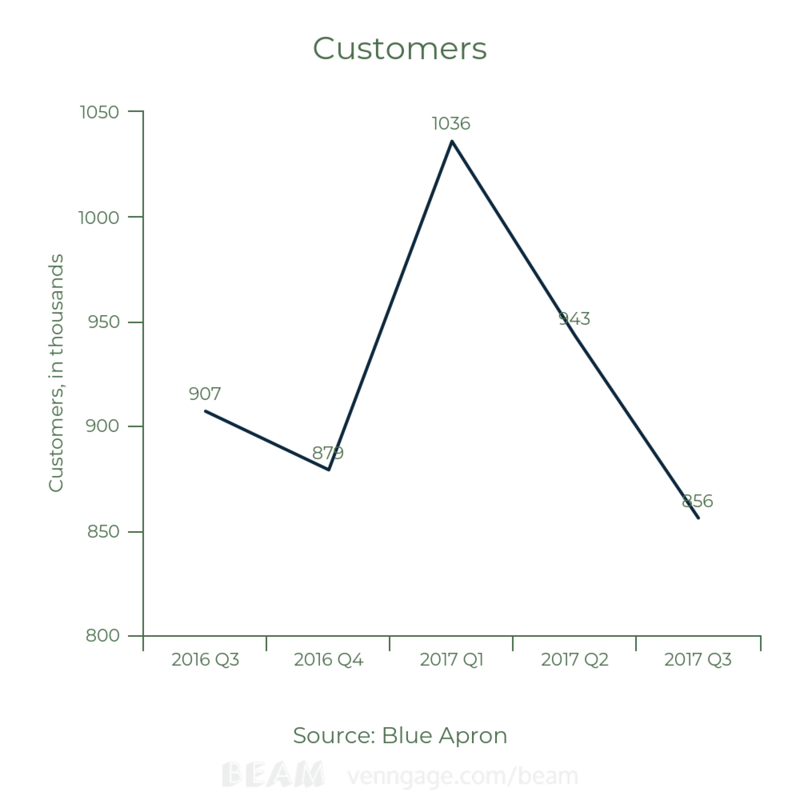 Late deliveries may be a byproduct of Blue Apron’s aggressive expansion that added more meal options, increased volume of operations and launched a new facility center. The company’s stock has been down nearly 70 percent since initial public offering in June, and Blue Apron has been facing enormous pressure from investors and the board to improve its performance. One of the fallouts is a recent change in the company’s leadership. Co-founder Matt Saltzberg was replaced as Blue Apron’s chief executive by Chief Financial Officer Brad Dickerson on Nov. 30. Saltzberg grew sales and revenue, but failed to bring 5-year-old Blue Apron any closer to being profitable. 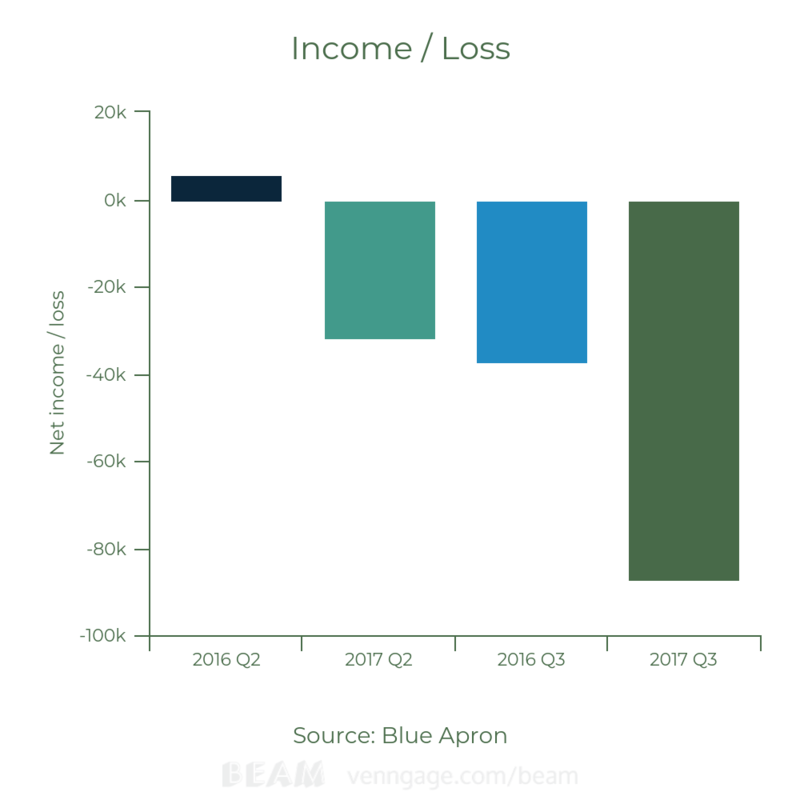 During his leadership the company’s third-quarter operating deficit ratio, which compares Blue Apron’s operating expenses and sales, hit a new low 32 percent. The deficit is down more than 80 percent since last year, at a time when a number of new meal-kit players only added to competition. Both Saltzberg and Dickerson wanted the company to be the leader in meal-kit delivery business. To compete, they introduced something Blue Apron clients have long been waiting for: more recipe options. Starting in September, Blue Apron’s two-person plan offered eight meal choices each week instead of six and gave customers the option of receiving meals two or three times per week. The family-plan offers four meal choices with two, three or four deliveries a week. 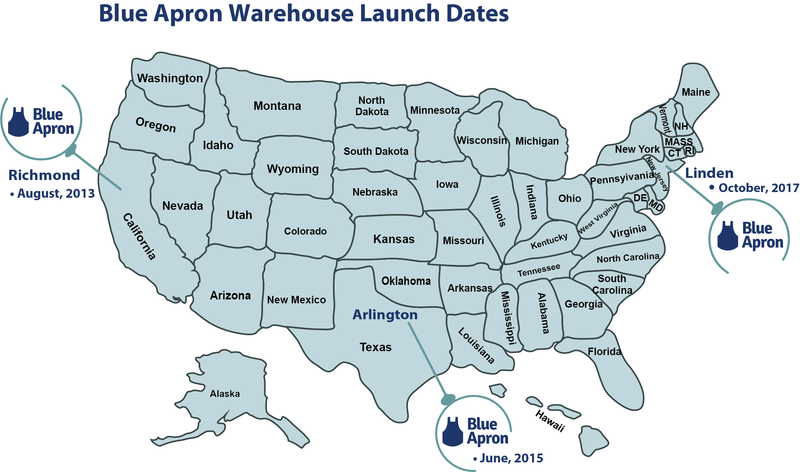 To expand and streamline operations, Blue Apron has moved to a new automated facility in Linden, N.J, in fall 2017. But the move slowed everything down instead. The technology was part of the problem. Unlike fulfillment centers in Arlington, Texas, and Richmond, California, the new facility is fully automated. The warehouse uses a “pick-to-light” technology. When an order comes, it gets a unique barcode. A facility worker scans that barcode, which turns on light under each ingredient on the shelf. Workers put those ingredients in a box and manually turn the lights off. While pick-to-light technology is more efficient in large warehouses and can save a company money on labor costs, it is also more complex than assembly-line packaging, in which all workers put one ingredient after another in the box. An expanded product offering that adds pressure on operations makes it easier for workers to make a mistake like forgetting to put an ingredient in a box or sending out a box late. “There are all kinds of risks when you’re moving, adding new equipment, and then adding more SKUs, which are recipe options, at the same time,” said Christi Clinger, chief operating officer of Nerium International and a former vice president for logistics at convenience-store chain 7-Eleven. Blue Apron customers who pay for an easy way to put a dinner on the table will accept missing ingredients or late deliveries only so many times before they cancel their subscriptions. Oliva Torres of Hillsborough Township, N.J., ordered her first Blue Apron meal kit for Oct. 30. That night, she said, she skipped grocery-shopping, excited to try something new. After 6 p.m. Torres received email from Blue Apron telling her the order was delayed until the next day. She got her order two weeks later on Nov. 13. It was delayed several times, though Linden facility was a 40-minute drive from Torres’ house. After back-and-forth emails with customer service, Torres said she was not satisfied with the response and canceled her subscription. After reviewing the Linden facility’s performance, the company is no longer looking to build a brand-new facility in Fairfield, Calif. Linden has disappointed Blue Apron leadership with delays in ramping up. The Linden warehouse handled only 3 percent of the company’s total volume in the second quarter. Now it handles half of all national operations, but it has still far to go. Blue Apron’s stock is down nearly 70 percent since IPO and was trading $3 per share on Dec. 1. “I don’t look at my stock right now; I’ll look at it in a couple of years,” said Stefan Wiles, a former annual general manager at Blue Apron, who visited the Linden facility while it was still in the works. Even if the Linden facility boosts revenue in a long run, Blue Apron needs to cut expenses or it never becomes profitable, said Chuck Cerankosky of Northcoast Research who has a sell rating for Blue Apron’s stock with a $2 target price. Cerankosky is not just pessimistic about Blue Apron’s prospects, he believes the meal-kit delivery is a troubled business model overall. Dickerson, who spent eleven years at the apparel maker Under Armor, including as a Chief Operations Officer, can help stabilize Blue Apron’s operations once he has a daily supervision as a chief executive, said Kerry Rice of Needham and Co., who is one of two analysts with a buy rating for Blue Apron stock. Blue Apron has shifted its sights away from gaining new customers — a risky move for a newly public company — while it struggles to hold onto those it has. The company cut marketing spending 31 percent year-over-year. Dickerson said he wants to see the operating margin improve before reinvesting in marketing. While expanded meal options may increase sales per customer, the company’s key metric, late deliveries can cost revenue. 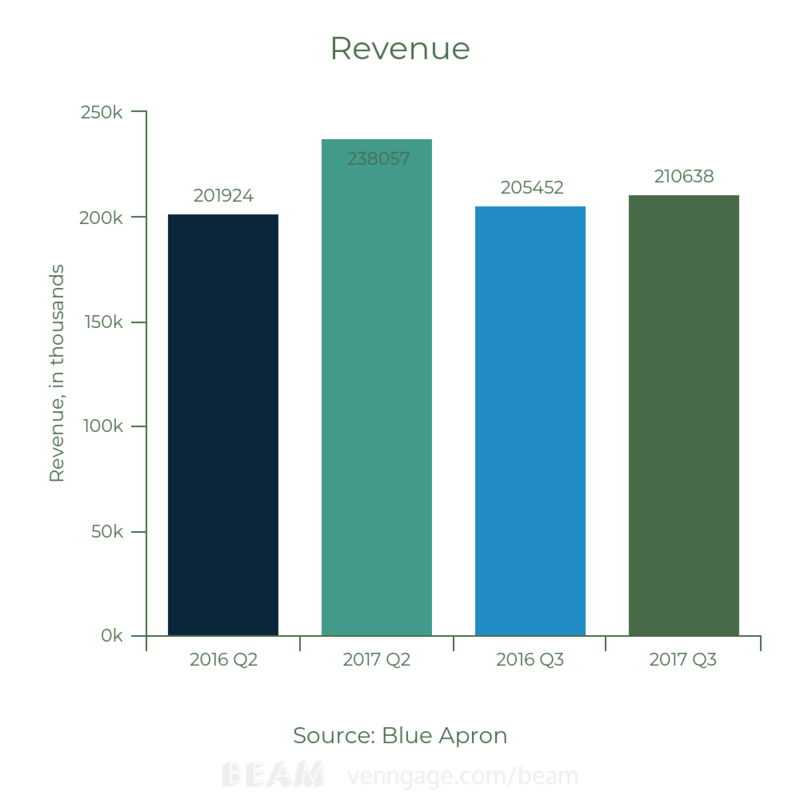 Blue Apron revenue per customer increased 8 percent year-over-year, from $227 to $245, but the number of customers declined 9 percent from the second quarter to 860,000 in the third quarter. Blue Apron’s three warehouses cost the company more than it can afford. To keep ingredients fresh, the company must equip every facility with refrigerators and have multiple temperature zones in the building, depending on produce stored. Blue Apron also must meet FDA guidelines for meat that involve additional inspection costs. All that costs Blue Apron money at a time when the company is trying to maintain a reasonable price point. “If your facility costs a million dollars and you don’t make over a million dollars from products running through that facility, then your business it not going to work,” said Clinger at Nerium International. But Martin says Blue Apron could have avoided those operational challenges by simply hiring a third-party logistics company with warehouses and systems in place. While more costly, Martin says that option would be less risky. But Blue Apron wanted to control its own destiny.